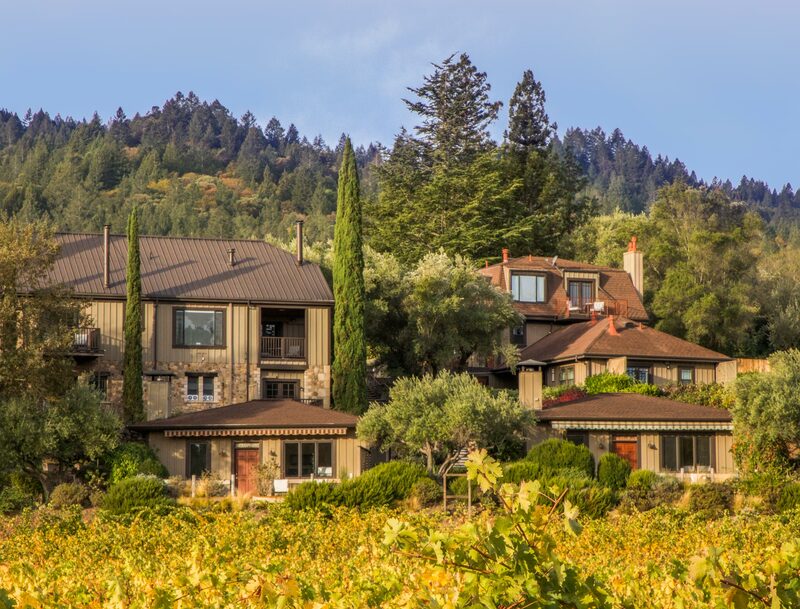 Experience our beautifully renovated accommodations ranging from 24 spacious guest rooms, and five individual cottages, 80% of which boast views of the vineyards, mountains and sprawling lawns and botanical varietals that surround. Our rooms recently enhanced décor was designed and inspired by the vineyards found outside the windows. Subtle and understated, the interiors were conceived to frame the “pictures” of Napa’s colorful, always changing scenery. Escape into beloved California Wine Country with our Advance Purchase package which includes complimentary high-speed Wi-Fi, a daily Wine Country breakfast and evening wine tasting on Friday and Saturday evenings hosted by a local vintner. Book at least 14 days in advance, restrictions apply. This is an advance purchase, pre-paid rate. No refunds if cancelled or changed. Your credit card will be charged in full for the total amount of your stay. Petite King guest rooms include a King bed with luxurious bedding for an authentic and relaxing Napa Valley experience. After a busy day of Napa Valley wine tasting or culinary arts these rooms offer a quiet retreat for relaxation and rejuvenation before the next day’s Napa Valley adventures. Sit on the outdoor patio or balcony to drink up the Vineyard views along with a favorite glass of Napa Valley wine. 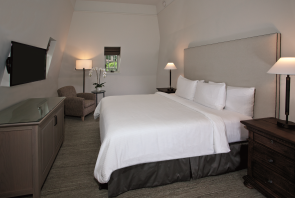 Each guest room features one king sized bed with the most sumptuous of bedding, as well as large and airy bathrooms. 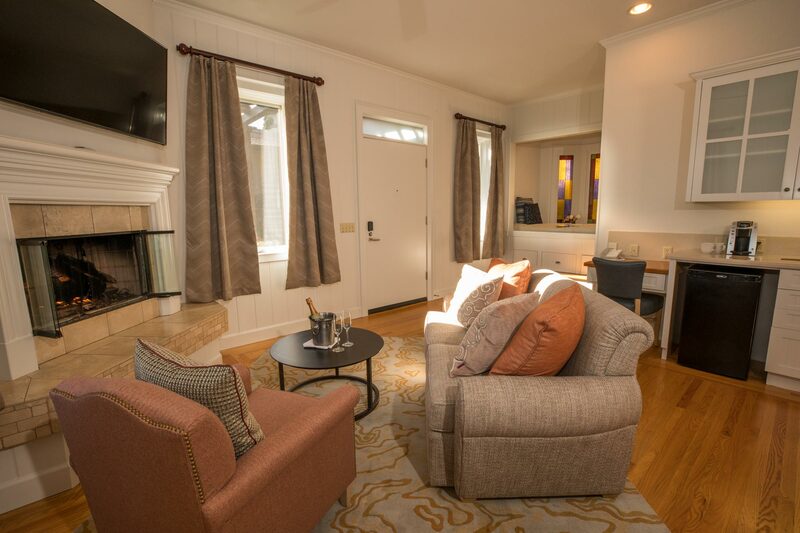 After a busy day of Napa Valley wine tasting or culinary arts these spacious rooms offer a quiet retreat for relaxation and rejuvenation before the next day’s Napa Valley adventures. 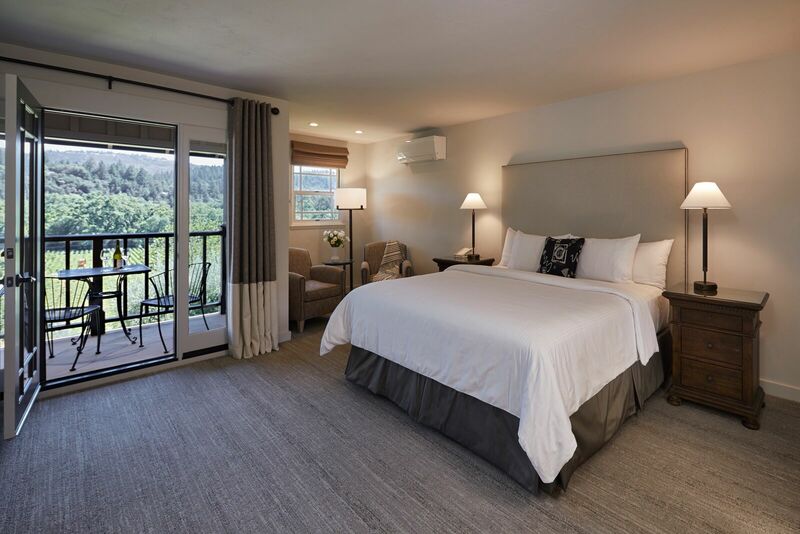 These Superior Vineyard View rooms offer incredible views of the Napa Valley Cascades with planted vineyards and leafy forests. Sit on the outdoor patio or balcony to drink up the views along with a favorite glass of Napa Valley wine. Each guest room features one King sized bed with the most sumptuous of linens, as well as large and airy bathrooms with full sized showers. 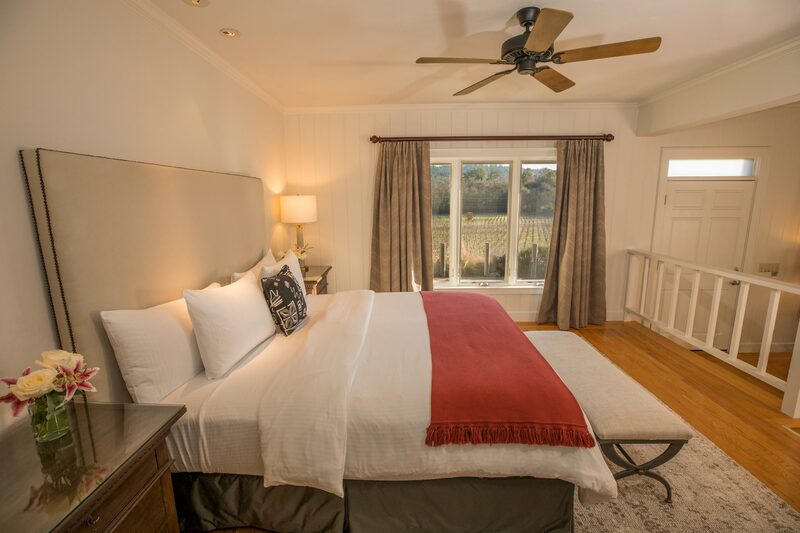 These beautiful and spacious rooms are only steps away from the Inn’s luxuriant gardens and nearby vineyards of Cabernet grapes. The 800 square foot residential style cottages each feature large king sized beds made even more comfortable with the highest quality bedding, as well as large bathrooms with soaking tubs and showers. 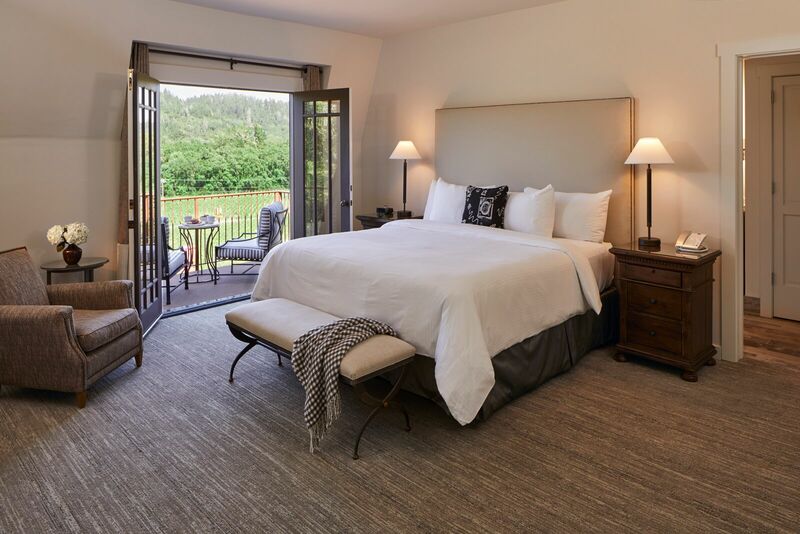 After a busy day of Napa Valley wine tasting or culinary arts these spacious rooms, offer an expansive outdoor patio for a quiet retreat of relaxation and rejuvenation before the next day’s Napa Valley adventures. The 800 square foot residential style cottages each feature large king sized beds made even more comfortable with the highest quality bedding, as well as large bathrooms with soaking tubs and showers. 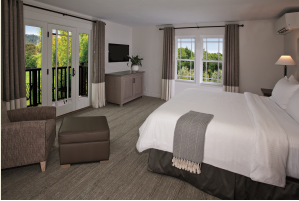 These spacious rooms, offer an private expansive outdoor patio with views of the Napa Valley Cascades with planted vineyards and leafy forests. for a quiet retreat of relaxation and rejuvenation before the next day’s Napa Valley adventures. These beautiful rooms are only steps away from the Inn’s luxuriant gardens and nearby vineyards of Cabernet grapes. Copyright 2016. Wine Country Inn. All Rights Reserved.